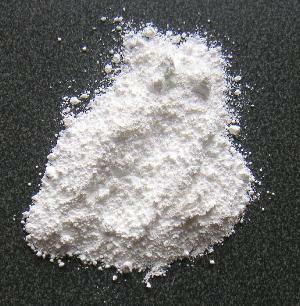 Titanium dioxide is a titanium compound. It generally looks like a fine, white powder, not unlike flour, with nuances varying by purity of the sample. Ithat has two main notable characteristics. Titanium oxide display many interesting properties.For a start, is the most common natural state in which titanium is found. In its basic form it’s a mix of titanium and oxygen, with the chemical formula TI O 2. The prefix “di” comes from the existence of two atoms of oxygen, so the term is more specific than the more general titanium oxide, as titanium can also mix with oxygen in other ways. But, in general use, those two terms are usually used (incorrectly) as synonyms. The two most common minerals that are extracted and processed for titanium production are rutile – which contains titanium as titanium dioxide TIO2, and ilmenite – which is made of crystalline iron titanium oxide – FeTIO3. You may deduce from the formula that the later has one iron atom, one titanium, and three atoms of oxygen. Processing of dioxide from those two minerals involves an intermediary stage of titanium tetrachloride, which is also an interesting titanium compound by itself. The property that makes TIO2 accountable for the largest use of titanium is the high refractive index, highest than any material known to man, even greater than diamond. The refractive index expresses the ability to bend and scatter light. As scientists discovered this characteristic they began researching possibilities of using titanium dioxide as a pigment. And they succeeded back in 1916. Today, titanium pigment is by far the most important material used by the paint industry for its whiteness and opacity. The pigment is made by grounding pure dioxide to a fine white powder which gives a sharp whiteness to materials is added into. It is also worth noting that "fine" powder has become a complicated matter these days, with the introduction of nano-technology, and there are some debates regarding the use of titanium dioxide in sunscreens. The rapidly developing use of nanotechnology in sunscreens that promoted increased interaction of TIO2 with humans have also lead to several studies researching possible allergic effects. Quick fact : Due to widespread use of titanium dioxide in paint industry, there is a white pigment called "titanium white". Titanium oxide is so white, that sometimes is combined to other pigments to lessen this effect. A good refractive index means also that paint containing this compound has a very high hiding strength – which is critical for using less material when painting. Titanium oxide has the highest resistance to discoloration under UV light among its competitors – zinc, lead and others – making it a perfect choice for the plastics industry, as plastics products are most affected by degradation due to prolonged sun exposure. Under the effect of UV light, the dioxide also display specific behaviour, known as "the photocatalyst effect" which is the basis for manufacturing self cleaning windows. The ability to absorb UV radiation, which has seen increased levels in the last decades, and the fact that titanium is virtually allergy free, has naturally put titanium oxide in good use in sunscreen products and as an additive in other cosmetics that need white pigments. When is the last time you saw a non-white cream ? For more information on use of titanium oxide in the cosmetics industry check my friend Sandy site aboutmineral makeup. Several brands of candy, such as Skittles and M&M, have titanium oxide in the coating, though its less visible hidden under E171 designation.